The acidic properties of lemon juice help to heal rough and dry skin, thus preventing cracking on the soles of the feet (1). 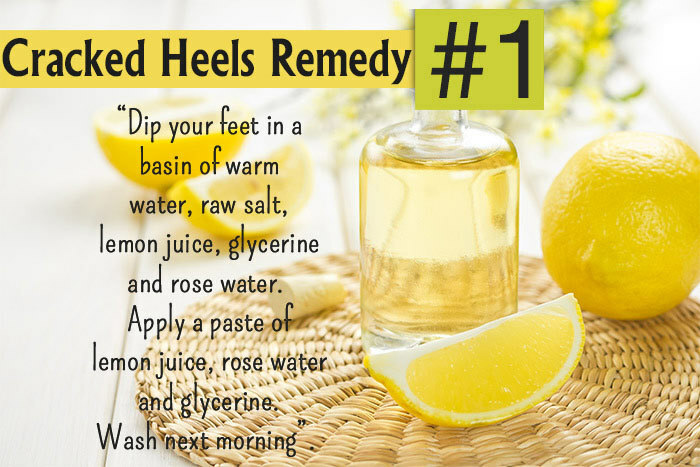 Along with lemon’s acidic properties, the combination of rosewater and glycerin turns out to be an effective treatment for cracked heels. Glycerin softens the skin (which is why it is used in most of the cosmetic products) whereas rosewater has anti-inflammatory and antiseptic properties that help in healing cracks (2). Lemon juice can cause irritation and dryness to your skin. Make sure you do a patch test to check for any allergic reactions. Wash your feet and dry them up completely using a clean towel. Then apply a layer of vegetable oil on the cracked parts of your feet. Wear a pair of thick socks and leave it on overnight. Wash your feet in the morning. Once every day before going to bed. The fats in the hydrogenated vegetable oil nourish the skin and heal cracked feet (3). Blend a ripe banana and half an avocado. Apply this thick, creamy paste over your heels and feet. Keep it on for 15 to 20 minutes and then wash off your feet with lukewarm water. You can do this every day till your heels become soft. Avocados are rich in several essential oils, vitamins, and fats that help repair dry skin (4). Banana works as a moisturizer and makes your skin softer and smoother (5). Soak your feet in warm water for about 15-20 minutes. Rinse and pat dry. Mix one teaspoon of Vaseline and a few drops of lemon juice. 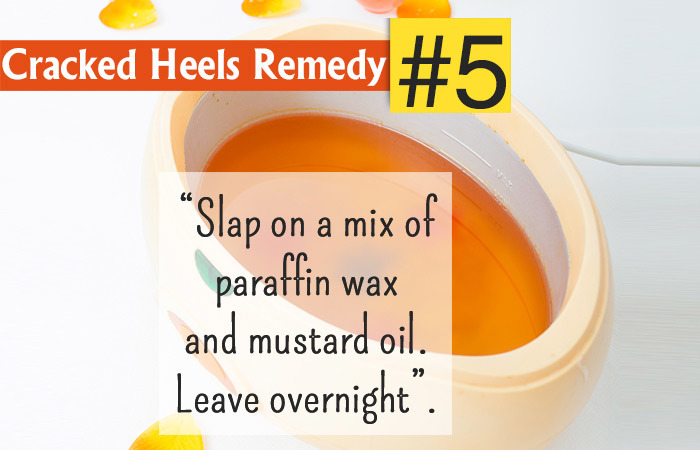 Rub this mixture over your heels and other cracked parts of the feet till it gets absorbed into the skin. Apply this mixture and wear a pair of woolen socks. Keep it on overnight and wash off in the morning. Woolen socks help trap the body’s heat and increase the effectiveness of the mixture. Regularly before going to bed. Lemon’s acidic properties and vaseline’s moisturizing properties help you get rid of dry and achy feet (6). Heat the mixture in a pan till the wax melts properly. Allow this to cool down to room temperature. Apply the mixture on your feet. To get the best results, apply before going to bed and wear a pair of socks. Once or twice a week before going to bed. Paraffin wax acts as a natural emollient that helps soften your skin. It turns out to be a good treatment for cracked and painful heels (7). Do not dip your feet in the wax when it is hot. If you’re a diabetic patient, then kindly do not try this treatment. Scrub off gently to obtain soft and supple feet. 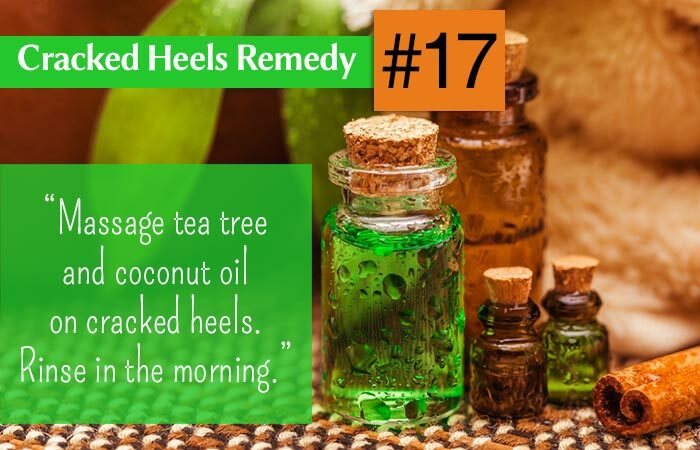 You can do this on a regular basis to get rid of cracked heels quickly. Honey is considered to be a natural antiseptic that helps heal cracked feet, and its soothing properties help revitalize the skin (8). Take two to three tablespoons of ground rice and add a few drops of honey and apple cider vinegar to make a thick paste. 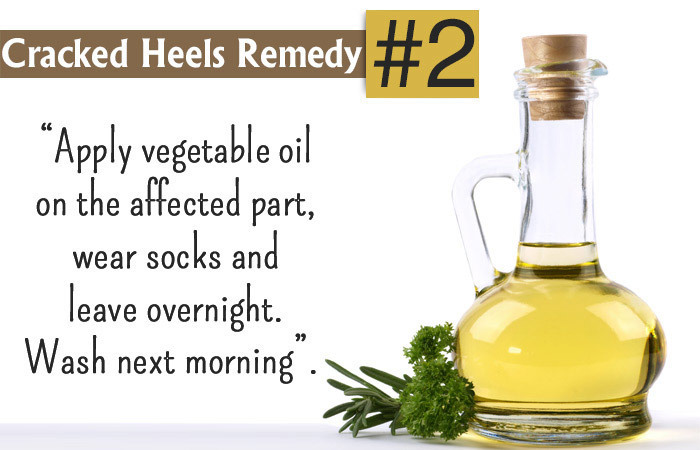 If your heels are extremely dry and cracked, you can add a teaspoon of olive oil or sweet almond oil. You can apply this foot scrub twice a week. Rice flour exfoliates, purifies, and remineralizes the skin, making it satin-smooth and soft (9). Apply some olive oil with the help of a cotton ball and gently massage your feet in a circular motion for 10-15 minutes. You can repeat this every day. Olive oil is a miracle healer and has nourishing properties that make your skin soft and supple (10). 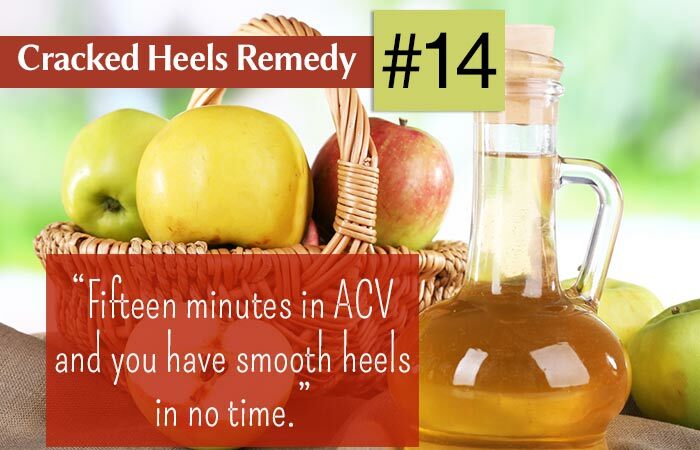 It is one of the most natural ways to get smooth, soft, and healthy heels. Mix the powdered oatmeal and olive oil to make a thick paste. 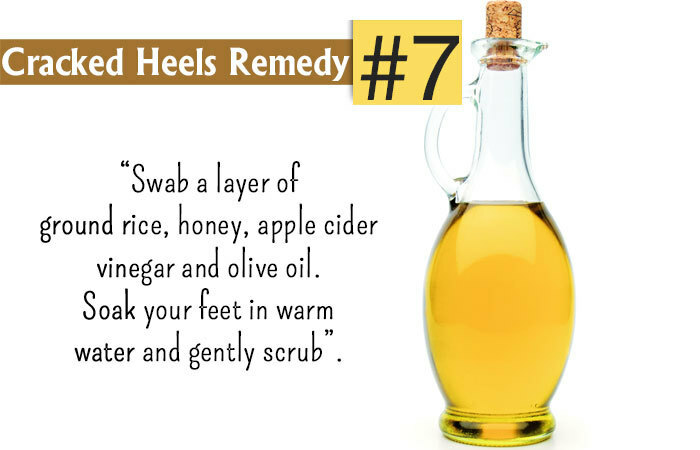 Apply this over your feet, especially over the heels and any cracked parts. Leave it on for about half an hour. Rinse off with cold water and pat dry. Every alternate day till you get rid of cracked heels. Oatmeal has anti-inflammatory and moisturizing properties that help remove dead skin cells and soften the skin (11). 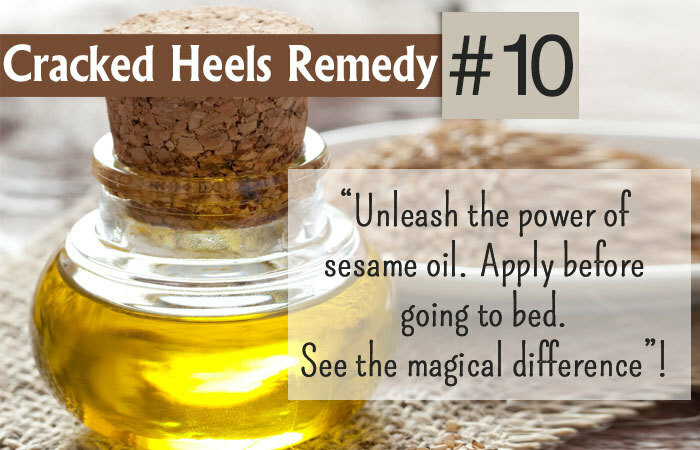 Apply sesame oil on your heels and any other cracked parts. Massage well till it is absorbed by the skin. Daily before going to bed. Sesame oil is considered to be very nourishing and moisturizing. 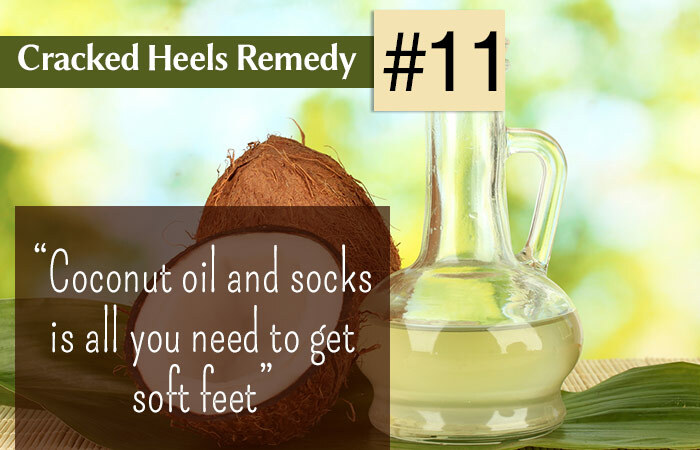 It helps soften and soothe dry and cracked feet very efficiently (12). Apply the oil liberally on your feet. Slip on the socks and go to bed. Shower as usual in the morning. Repeat this for a few days to get soft feet. Coconut oil is really hydrating for the skin. It moisturizes dry skin and also removes dead skin cells. It has to ability to penetrate to the deeper layers of the skin and nourish them (13, 14). Soak your feet for 10-15 minutes in the liquid mix containing the above mentioned ingredients. Remove your feet and scrub using the foot file or pumice stone to slough off the dead skin. Rinse with clean water, pat dry, and moisturize. Repeat this every day for three to four days until the dead skin wears off. 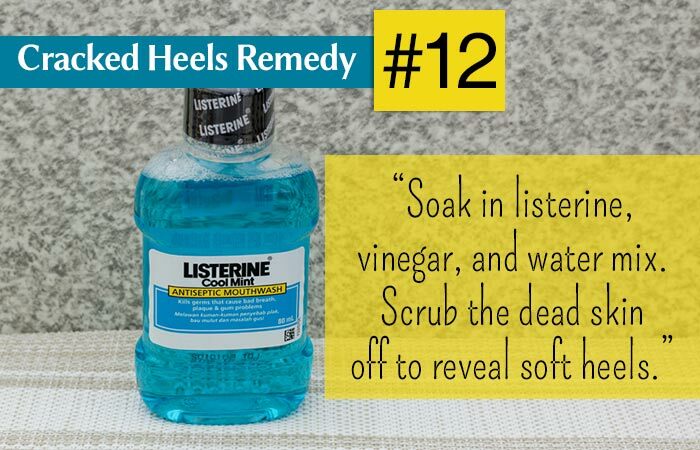 Soaking your feet in listerine will soften the hardened dead skin and make it easier to be scrubbed off. Listerine is also an antiseptic and soothes the skin because of the phytochemicals like menthol and thymol that are usually present in it (15). Fill 2/3rds of the bucket with warm water and add the baking soda. Mix well until the baking soda dissolves in the water. Soak your feet in this for 10 to 15 minutes. Remove your feet from the soak and scrub gently with the pumice stone. Baking soda is a commonly used exfoliant. It removes dead cells and also soothes the skin as it possesses anti-inflammatory properties (16, 17). Fill the basin with enough water to soak your feet in – about three to four cups. Add the apple cider vinegar and mix it well. Soak your feet in the water for about 15 minutes and scrub afterwards to remove the dead skin. Repeat this the next day or after a day’s gap, if required. The mild acids present in ACV will soften the dry and dead skin, making it easy to exfoliate (18). Once exfoliated, the fresh and healthy skin is revealed. Fill the foot basin with water and mix Epsom salt in. Soak your cracked feet in this for 15 minutes. Scrub to remove dead skin. Repeat this twice or thrice a week until your feet become soft. Epsom salt softens the skin and also soothes tired feet (19). Soak your feet in lukewarm water for a few minutes. Pat dry and apply aloe vera gel liberally on your feet. Wear socks and leave the gel on your feet overnight. Repeat this every night for four to five days and you will notice a vast difference in your feet. Aloe vera soothes dry and dead skin. It heals the ridges and cracks that have formed and increases collagen synthesis. The amino acids present in it are responsible for the skin-softening action (20). Mix the tea tree oil and coconut oil together. Apply on the cracked feet and massage for a minute or two. Cover with socks and leave it on overnight. Do this every night before going to bed until your cracked feet heal. Tea tree oil cleanses and conditions the skin, and makes it softer after regular use (21). Do not use tea tree oil directly as it can lead to rashes. Soak your feet in warm water for 10 to 15 minutes. Now, scrub your feet gently with the pumice stone to remove the dead skin that has softened up. Rinse with water and pat dry. Do not forget to moisturise your feet. The rough surface of the pumice stone can easily scrape off the softened dead skin. Below this lies the healthy and soft skin of your feet. Do not scrub too harshly with the pumice stone as it can easily damage the healthy layers of the skin. Make a hole in about three to four capsules and remove the oil present inside. Apply this oil on the affected area and massage it in for a minute. Reapply vitamin E oil twice or thrice a day. 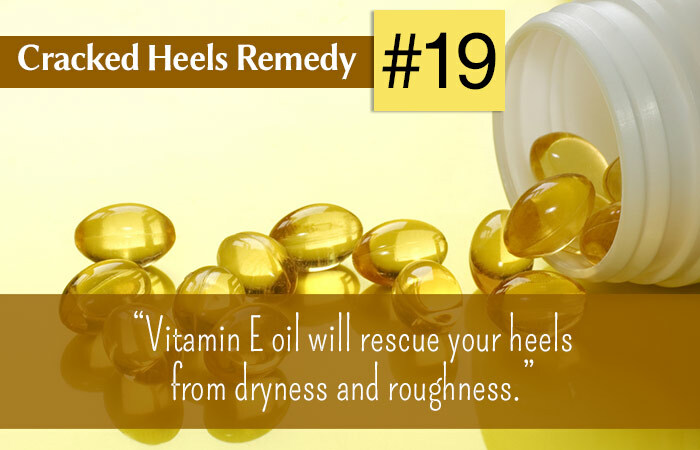 Vitamin E oil nourishes and hydrates the skin and makes your heels smooth and soft (22). Apply shea butter on your feet and massage them for a minute or two so that the shea butter gets absorbed easily. Slip on some socks and leave the shea butter on overnight. 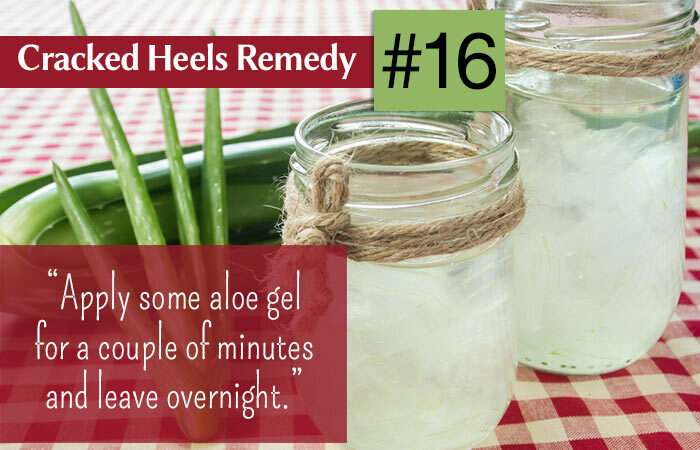 Repeat this for a few nights for soft heels. Shea butter is a well-known skin moisturizer that hydrates and nourishes the skin. It also possesses healing properties and improves various skin conditions related to dryness because of its vitamin A and vitamin E content (23). With proper care as mentioned above and relaxation, it takes about 7-14 days to see the first signs of healing. 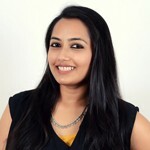 This depends on how badly your heels are cracked, if you are suffering from skin issues like psoriasis and eczema, or medical problems like diabetes and hormonal imbalance. There are many ways to accelerate the healing process of your cracked feet. The most effective ones are keeping your feet well moisturized, not exposing them to pollution, relaxing your feet, taking natural oil-based foot massages, soaking your feet in warm water with some lemon juice added to it, and treating medical conditions, skin problems, and obesity. 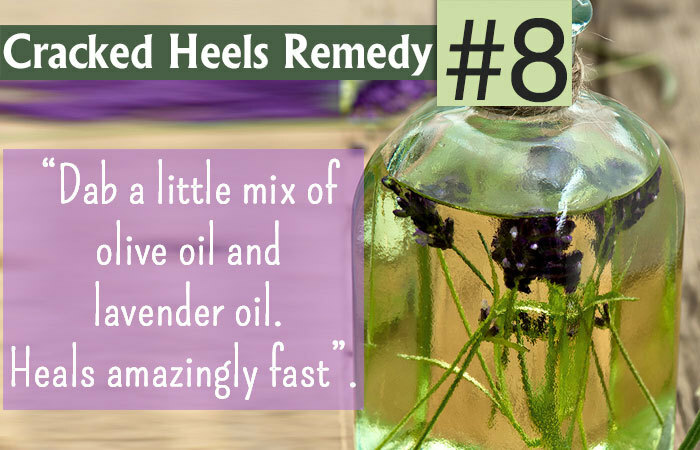 Now that you know how to get rid of cracked heels, what are you waiting for? 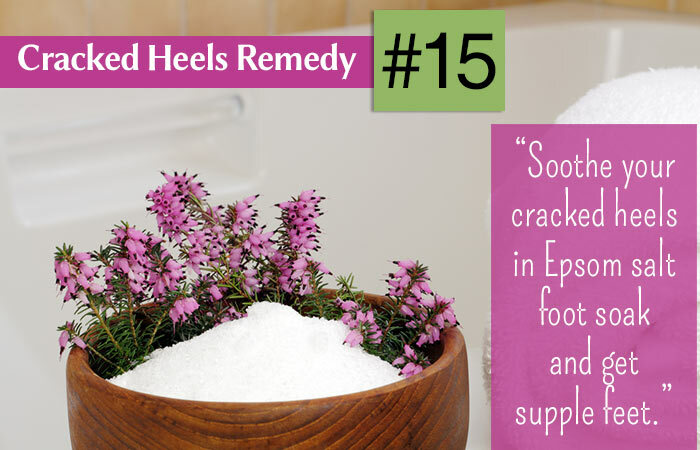 Try out these home remedies for cracked heels and see the difference. Share your views and experiences in the comments box below. Prevention is better than cure. 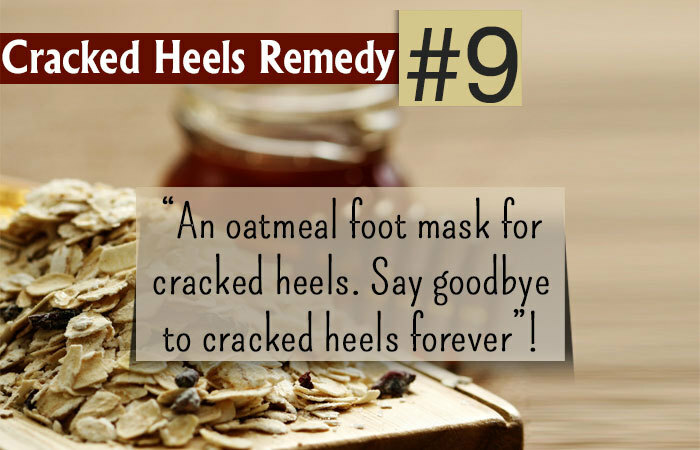 There are many home remedies and lifestyle tips to prevent cracking of heels. Proper moisturization is the first step to prevent dry heels. Wearing comfortable shoes, refraining from excessive walking, and avoiding over exposure to pollution are the easiest ways to prevent cracked heels. Scrubbing your heels regularly with pumice stone and dipping them in warm salt water or water with lemon juice added to it can keep them clean and soft. Relaxing your feet and indulging in foot massages with oil also prevents dryness, and thereby cracked heels. With proper care and moisturizing, cracked heels can be cured. What Are The Symptoms For Dry Cracked Heels? Prevention is better than cure. 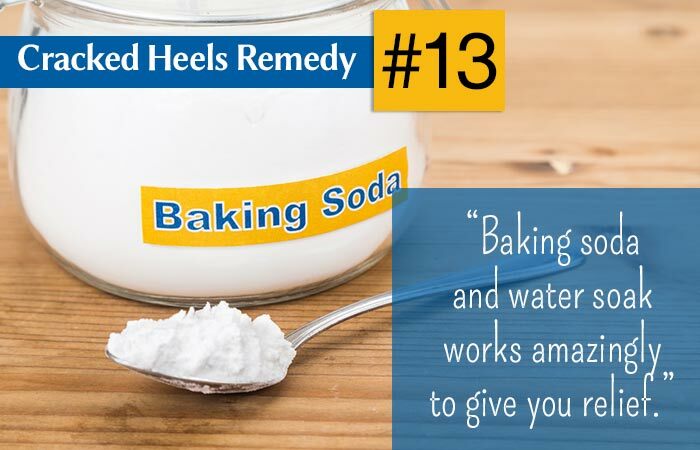 There are many home remedies and lifestyle tips to prevent cracking of heels. Proper moisturization is the first step to prevent dry heels. Wearing comfortable shoes, refraining from excessive walking, and avoiding over exposure to pollution are the easiest ways to prevent cracked heels. 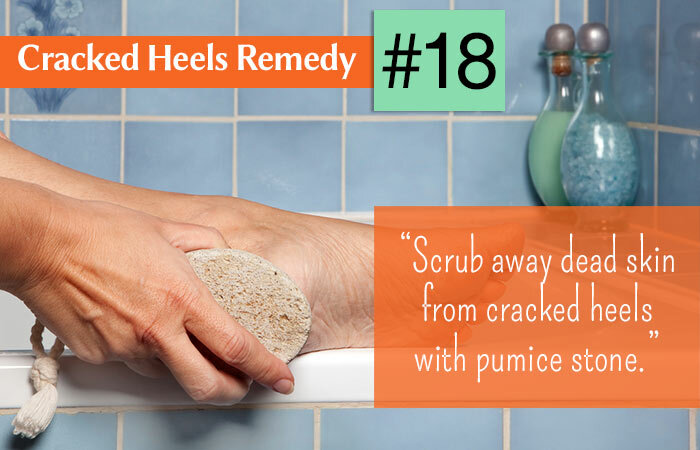 Scrubbing your heels regularly with pumice stone and dipping them in warm salt water or water with lemon juice added to it can keep them clean and soft. Relaxing your feet and getting foot massages with oil also prevents dryness, and thereby cracked heels. Does Diabetes Cause Cracked Heels? Yes, diabetes is one of the causes of cracked heels. Uncontrolled blood sugar levels damage nerves of the feet, which leads to dry skin. As there are no oil glands present on the skin of the feet, they are usually dry. The thick dry skin on the heels, known as callus, can develop heel fissures. Being overly dry, it cracks and bleeds. Controlling diabetes can cure cracked heels too. Diabetics are prone to serious infections from cracked heels that are difficult to cure. Taking good care of the feet and treating cracked heels in the initial phase is advisable for diabetics. How Long Will It Take To Cure Cracked Heels? With proper care and relaxation, it takes about 7­14 days to see the first signs of healing. This depends on how badly your heels are cracked, skin issues like psoriasis and eczema or medical problems like diabetes and hormonal imbalance. There are many ways to accelerate the healing process. The most effective ones are keeping your feet well moisturized, not exposing them to pollution, relaxing your feet, taking natural oil- based foot massages, soaking your feet in warm water with some lemon juice added to it, and treating medical conditions, skin problems, and obesity. Why Do Only Heels Crack But Not Other Parts Of The Foot? As there are no oil glands on the skin of your feet, this area tends to become dry. The skin on the heels is thick and dry and with excessive activity, tends to bleed and crack. Standing on a cold or hard floor for long, intensive walking, and being overweight are some of the reasons why heels crack. The middle part of the foot is hollow and well secured. Most of the body’s weight is borne by the heels. Because they are dry and bloated, they tend to crack easily. At times, these cracks go deep and start bleeding.